Heat oven to 300 degrees and line a large baking sheet with parchment paper. Mix all ingredients except the chia and flax. Spread evenly on parchment and bake for 20 minutes. 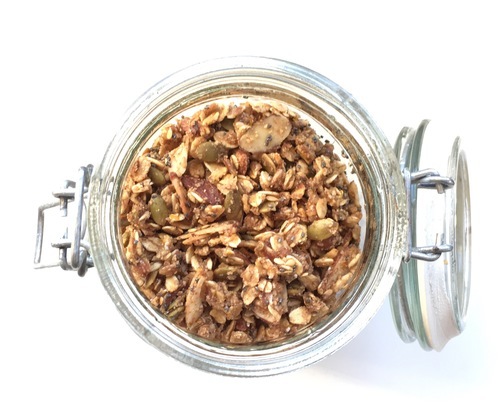 Carefully lift parchment and dump granola in the original mixing bowl. Add chia and flax and stir granola to incorporate. Now, on the same baking sheet with no parchment, spread the mix back out and bake for another 15 minutes. Stir on the baking sheet. Bake for the last time another 10 minutes. Let cool completely. It hardens upon cooling.